A house, usually constructed of wood, with a roof that extends steeply downward from both sides of a central ridge, almost to the building foundation; the roof is supported by a rigid structural framework in the shape of the capital letter A. One or both end walls of the house are often almost completely glazed. Much of the living area on the ground floor is open to the underside of the roof; the bedrooms are frequently located on a balcony directly under the roof; often, there is an exterior deck at one end or both ends of the house. Also see rafter house. Most recently, the southern California firm transformed a hermetic A-frame house perched on the edge of a canyon by making modest additions, opening up the interiors to decks and sweeping views, and wrapping the hybrid form in a white scrim. The surreal duality between apparent normality and deep-rooted dysfunction is conveyed in bold strokes via Mark Wendland's three-tiered set, depicting a suburban A-frame house with scaffolding and pop-art panels, emblazoned with a dazzling comicstrip palette by brilliant lighting designer Kevin Adams. Bursting the bubble bath:We all know property prices have gone a bit mad, but pounds 5m for a 20-acre patch of scrub, with a bungalow and an A-frame house with pull-out beds? Passersby are often intrigued by the signs, their A-frame house, the covered bridge that interrupts the sidewalk to their house, and the 1920s gas station across the highway from their home. COUNTRYSIDE folk being what they are, I received a raft of responses--inquiries about how to build an A-frame house, Harry and Josie asked about how they take care to recycle things to extend their useful life, and a correspondence with a young girl in Connecticut whose aunt lives here in town. It's an A-frame house whose facets of glass, expansive living room, open beams and interior courtyard look as fresh today as they did under President Lyndon B. The letter "A" designates the same thing no matter how it is written; a drawing of an A-frame house, on the other hand, takes its significance from the innumerable details of its graphic execution. Then it's down the road to Wanda and Hartley (Arsinee Khanjian and Earl Pastko): fuzzy arts-and-crafts types who live in an A-frame house of their own construction. Eight hours after the eruption, here came a monstrous wall of mud-a mixture of melted glacial ice and volcanic ash-down the Toutle, filling his just-completed A-frame house with silt, ash, water, and one monstrous log. In a typical installation, gravity flow racks located on each side of the A-frame house the reserve stock. Plastered walls and built-ins give characterand a contemporary look to this 15-year-old A-frame house (also shown on page 108). 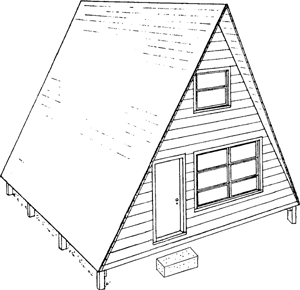 I would like to hear pros and cons from anyone who has either built and/or lived in an A-frame house.